This morning on the ride to work I was thinking about the things I've always liked about the Christmas season. As a Christian, there is the celebration of the birth of Christ, which I LOVE, but there's something else. Ideally this time of year, people seem to try a little harder to be nice to each other. There's this "Well hey, I'll do that for you... it's Christmas!" thing going on. As if we are required to have an excuse to do something helpful or friendly to someone! Being nice at Christmas is even a big part of our holiday entertainment selections, such as the story about the Grinch and the one about Ebeneezer Scrooge. Of course, at Christmastime we have historical precedent for "being nice at Christmas" in people like Saint Nicholas (not Santa Claus... the canonized Saint) and Duke Wenceslas (yes, he was real, but no, technically he was not a king, no matter what the song says) who took the opportunity of the season to be very generous to others. But I doubt either of them would want acts of kindness to be limited to the last month of the year! If they were here today, doubtless they would tell us to extend our kindness and generosity every time the opportunity presented itself, whether in December or some other month. But there is a way to do good deeds that is acceptable to God. The key is simply to let those good deeds flow to others, via ourselves, by inspiration from God. As though we were wires carrying power from God to the persons we are ministering to. And how do you know if you're doing something that way or some other way? Well, you certainly need to be in tune with the Holy Spirit, and you get that way through worship and prayer and Bible study; that's just Being A Christian 101. I suspect that while we are on this imperfect world with imperfect bodies and not-quite-totally-renewed minds, there will always be at least a small element of selfishness in doing something nice for someone to whom we owe nothing; after all, it does feel nice to do something kind and then be appreciated for it. But I think that the more in tune we are to the Holy Spirit, the less that matters to us and the more it matters that we are doing what is pleasing to God. And in a nutshell, that is what the Christian Life is all about: doing what is pleasing to God, no matter what happens as a result and no matter what the cost. As we move out of the "oughts" (I look forward to telling kids in future years that "I remember the great Tulsa blizzard of ought-nine!" hehe) into the twenty-tens and -teens, here's an idea: let's seek to daily be more like Jesus. Let's seek to do only the Father's Will. But let's not do it because we know it's the right thing to do and make up our minds to do it; let's do it because we are so close to God and He has influenced our attitudes so much that it has become natural for us to do His will. Because His nature has become our nature. Not because we are trying to act like Him, but because we have in reality become a little more like Him! 3. One day Jesus will come again, in the clouds to defeat darkness once and for all and to physically rule on the Earth! This year I've spent a lot of time reading about the End Times, doing serious studies through the book of Revelation twice and for fun, reading the entire Left Behind series. Whatever your views on the circumstances surrounding His second coming, it sure is an exciting thing to think that one day peace really will reign on Earth, and God's goodwill really will be physically present for all people! Have a merry Christmas. Remember Jesus. If He hasn't yet come into your heart, say a prayer and invite Him into your life. Love your family. The last few days of 2009 can be the best Advent season ever! I don't know how I came to know about Oral Roberts University. I don't really remember Christian TV being on at my house that much when I was a kid; probably I first heard Oral Roberts on TV growing up, but I certainly don't remember much about it. When I was in high school I was a pretty Bible-thumpin' guy... I even hauled my NKJV Open Bible to school with me every day... but I was too shy to be very good at sharing my faith with people directly. I did know one thing, though: I wanted to go to college, but I wanted to go to a "Christian" college. If you had asked me why I wanted to go to a "Christian" college as opposed to the state schools that were way cheaper (or other private schools that were maybe more prestigious and which my SAT scores could have gotten me into), I don't know that I could have given you a coherent answer, but I knew what I had on my heart. And for some reason, ORU was the only Christian school that seemed like a likely candidate. (I did briefly consider a denominational school or two, but once I had visited the ORU campus on one of their "college weekends", my mind was made up.) I wound up on campus for classes not knowing too much about Oral Roberts, or Richard Roberts, or honestly, about Tulsa or Oklahoma. But I showed up, and I stayed for four years, and my life has been drastically different because of it. I've noticed as I've lost loved ones through the years that there seems to be an astounding amount of clarity about the person's character after they die. Whether it's because I finally get to hear what people really think, or it's because I'm finally comfortable taking sides because the person is no longer able to change on me, I don't know. But whatever the reason, after attending the memorial service today, I feel like I understand Oral Roberts now even better than I did the semester he personally taught one of my classes in Mabee Center every week. (Aside: one of my favorite memories of that class is the first time Oral Roberts came up to speak, and started his trademark line, "Something GOOD...!" and the place went to pieces. Like the guy or not, it was fun to hear him say it! The rest of the line, for people born too late to be familiar with it, is "...is going to happen to you!") Anyway, in the newspaper articles that were in the Tulsa World last week and in the things people said today, a picture of Oral Roberts emerged for me that is much simpler, I think, than the one mentally painted by most people. Oral Roberts was born into poverty. He had some college work behind him, but he wasn't particularly sophisticated. It seems to me that Oral Roberts was actually a quite uncomplicated man; he read his Bible, chose to believe what it said, and... well, that's about it. 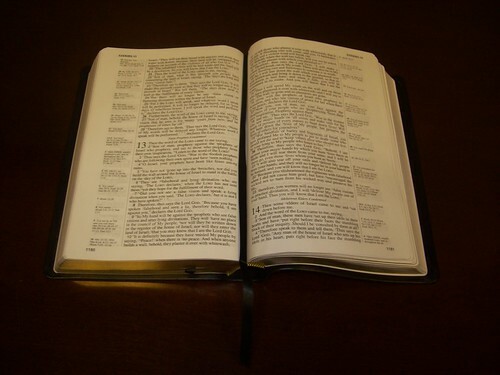 If the Bible said it, he hung on until the world around him reflected what he saw in the Word. I do think Oral Roberts made a few colossal blunders in his day, the most public ones surrounding the City of Faith hospital, about which I blogged a few months ago. 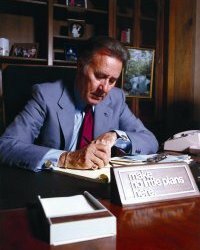 Oral Roberts planned a huge hospital complex for Tulsa, and then he went on TV and told the world that God said to him in a vision that if Oral didn't raise the money to build the hospital, God would take Oral home to heaven. It was the only thing approaching a scandal to ever directly hit Oral Roberts' ministry. Ultimately he did raise the money and he did build the hospital... but after only a few years of operation, it was basically closed down (later it became the home to a Cancer Treatment Center of America, and now I don't think there's a medical facility there at all.) Now, I don't know whether Oral Roberts' vision came from God or not, but I can see that the hospital failed. And I would also have to say that even if God gave Oral that kind of vision, it might not have been the right kind of thing to share on television... it sounds like a personal challenge to Oral himself to me. As in a marriage or any other kind of intimate relationship, some things are to be shared only between the participants. Maybe Oral felt like his partners were as close as family members. And maybe they were, but not everybody watching him on TV fell into the "partners" class. But it seems clear to me that whatever Oral Roberts heard or saw, he misinterpreted. Otherwise the City of Faith Hospital would still be seeing patients and preparing medical students to this day. But the two biggest things in Oral's life that were not blunders were his healing/TV ministry, which reached millions or billions with the Gospel and with healing, and Oral Roberts University itself. Oral Roberts was given both of those dreams by God at the age of seventeen; one of them began to happen immediately as Oral began to hold evangelistic crusades, and the other took a bit longer, but Oral's obedience to God allowed both to come to fruition. Both reached countless people with the Word of God, and as an alumnus of the school who has seen the post-ORU lives of my college acquaintances, and knowing that my graduating class is only one of some forty that have passed through, I can tell you that the impact on lives has been enormous. Whether you agree with everything Oral Roberts said or not, it's hard to deny that he was able to reach people with his message. I loved how he summarized it himself in the biographical video today: "If God says to jump through a wall, jump! And trust God to make a hole in the wall!" Let me tell you a story. Many years ago, right here in Tulsa, Oral Roberts made a trip to an area hospital. He went up to the pediatric intensive care unit and began to pray for the healing of the babies. I'm told that as he prayed for them, the babies began to improve immediately! One of the babies, a little girl named Linda, had been born with congestive heart failure. She had been in the hospital for weeks, and she was not expected to survive. After Oral prayed for her, her health improved, and she grew up knowing she had almost died but had been healed when Oral Roberts prayed for her when she was an infant. When I met her as an adult, she was going by her middle name, Cathy, and the only trace of her infant heart trouble was a minor case of mitral valve prolapse which was not life-threatening. And even that was healed several years later when someone prayed for her during her pregnancy... with our first child! Oral Roberts' ministry has affected many, many people in as many different ways as there are individuals. What would my life be like if he hadn't driven down to the PICU that day? Would my future wife have survived? What if he hadn't built the university he had dreamed of for so many years? Would I have been able to formulate the solid worldview that I was presented with there? Would I have ever come to Tulsa at all? Would I have met my wife, or all the fantastic Christian people I've met? Would I ever have done the kinds of things I've been able to do? I don't know how my life would have turned out, but I am grateful that Oral Roberts listened to the voice of God and did what he did. Because he was obedient, "Something GOOD!" certainly happened to me. If you've been keeping up, you know that I already have a beautiful new Bible. But if you were paying any attention before that, you also know that I love the ESV translation, and my ESV Study Bible is my favorite Bible study tool EVER. 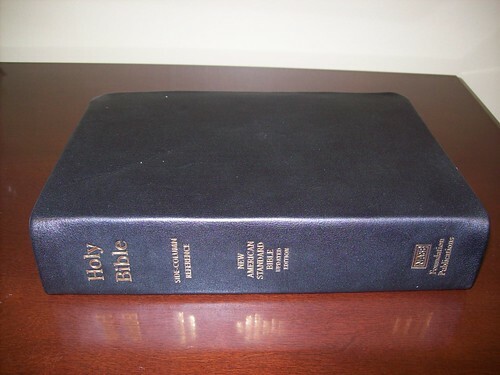 If I hadn't just gotten my new NRSV Bible to carry to church, I would still be sitting here wishing for a leatherbound ESV Study Bible to carry with; the one I have is the hardback edition, which I purchased over the leather version mainly because it was less expensive. So I'm not really in the market, but check it out... Mardel has the ESV Study Bible with your choice of five different covers on sale at a deep discount! 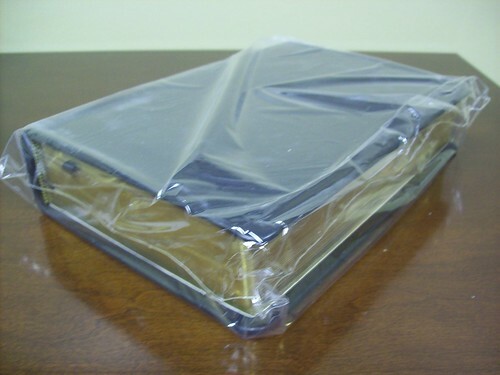 If you love to learn about the Word, you can't do better in one volume than the ESV Study Bible... and this sale takes these imitation leather cover copies below their price for the bardback version. Check out the sale! 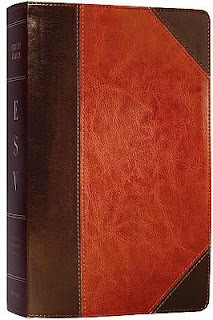 If you haven't seen the ESV Study Bible and want a taste of what is like, take a look at ESVStudyBible.org. It's awesome! The past few months we have become faithful viewers of TV's The Biggest Loser. The reason we've become so enthusiastic about the show is that a friend of ours, Danny Cahill, is a contestant this season! Danny started out at nearly 430 pounds, and by now he's right around 200. In something like 3 months, he's halved his size! It's amazing what the contestants on the show are able to do with the help of great trainers and a lot of motivation (the winner of the contest gets a big monetary prize in addition to the new life they've made for themselves!) In the course of the season you get to witness the emotional battles that the contestants face, many of them long-standing hurts or fears or both, and those things have to be overcome in order for the contestants to reach their goals. It's very eye-opening, and quite inspiring. Early this season, they took all of the contestants to a doctor for a medical evaluation (they are monitored by medical staff during the course of the show for safety, also, but this was an on-camera thing). The very first day during a short foot race, one of the contestants actually collapsed and had to be airlifted to the hospital; during the doctor visit, the other contestants got a serious reality check about the health issues related to being so overweight. One thing that Danny said several times over the course of the season, and other contestants said similar things, was that he wants to not die young... he wants to survive and be around for his wife and kids for many, many years. The season finale of The Biggest Loser is tonight. Danny has made it into the top 3 finalists; tonight if he has lost more weight than the other two finalists, he wins the season! The man is a weight-loss machine; the other finalists must be quaking in their boots. Good luck, Danny! We are TOTALLY rooting for you! We have talked to Danny several times during the past few months, and we have heard him speak publicly in church a couple of times about what the TBL contestants consistently refer to as their "journey," and it's clear that Danny's "journey" from obese to athletic and fit was one he made with help from the Holy Spirit. He is a living example of Romans 8:13. And there in my dream, I saw a table. And I knew it was my life. Looking straight at it I could make out nothing. With the details always just out of reach. With lenses five different colors. They would help me see the truth. I picked up the rose-colored glass. Through it, I saw my family and how much they love me. Money to buy things for them. My happinesses and my comforts. And I put down the rose-colored glass. 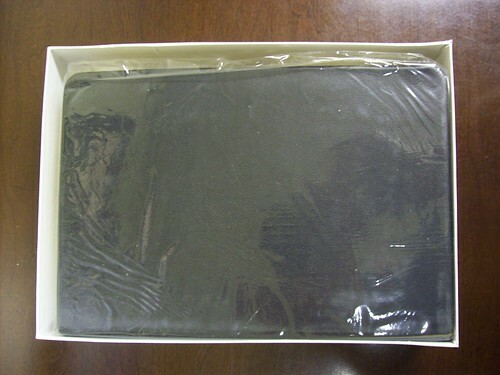 Then I picked up the sepia-colored glass. Through it I saw my childhood, with all its happy times. But I couldn't see the sad and hard times I remembered. It was comfortable but it was a lie, so I put down the sepia-colored glass. Then I picked up the glass with the blue lens. I couldn't live without happiness — I put down the blue glass. I hoped for better luck with the glass with the crystal-clear lens. The handle was white, and it cast a light of its own. I saw that I sometimes hate, even to the point of fury. I saw that I desire, even to the point of covetousness and sometimes lust. I saw that I am prideful and sometimes look at others with disdain. I saw that my selfishness often overrides my generosity. I dropped the lens like it had just come out of a fire. And the whole thing smelled of sulfur. The last glass scared me a little bit. The lens was transparent, but it was blood red. The handle was wooden, with a cross-beam, almost like a sword hilt. How awful would the WHOLE truth be? But I picked up the blood-red lens. The lens of The Whole Truth. And what I saw astounded me. And I also saw the sad and lonely times. I saw deaths, physical and emotional. That cause me to fail time and again. And I saw the deep, dark depression that sometimes seeks to consume me. I saw all of those things. Ancient history that never happened. It was also something else. And I knew I would fail again. And probably many more agains. Logos really is giving away some beautiful Bibles, and one of the ways to enter to win is a blog post like this one. :) You'll also notice the search box on the right-hand side of this page... this will take you to the online Logos Bible search site, which includes the NIV, ESV, NLT, NKJV, and KJV translations, and that's just for starters... there are also a dozen MORE translations to look at, too. Check it out; it might be just the Bible site to help you out in your study! Once upon a time, I worked in the IT department at a fairly large Christian publishing company. I had made a move to that company at the urging of a friend from my previous job who had done the same thing and who said I would love it. He was right: I did love it! (And he got a recruitment bonus, so everybody won!) I enjoyed my work, I enjoyed my coworkers (some of whom I am still in touch with), and it was just an all-around fun place to work. One day I was chatting with my department manager, whom I had become pretty good friends with by that time, and we agreed that we hoped we could continue to work there until we were too old and had to retire! There were several factors, I think, to what happened to me... the dot-com thing was coming to a head, and so the economy was suffering. The company had some financial struggles, and apparently some internal difficulties, most of which I didn't know about then and don't know about now and honestly hope to never know the details of. And then the September 11 attacks happened and the whole country went into an uproar. And because of some or all of those factors, the publishing company started selling off divisions and letting employees go. For months I felt a target on my back. I was the Web site programmer, for goodness sakes. What's easier to outsource than Web design and programming? I just knew that I was going to be among the first to go... but it didn't happen that way. Maybe it was because I had a new baby (about a year and a half old by that time) and a newer mortgage (about 8 months old by that time) to feed, and my bosses knew it. Hopefully it was because the quality of my work was such that they hated to see me go. I wound up hanging on for several months, but eventually one day in November of 2001, I found myself loading a couple of boxes of my personal belongings into my car and driving away, unemployed. Fast-forward to yesterday. 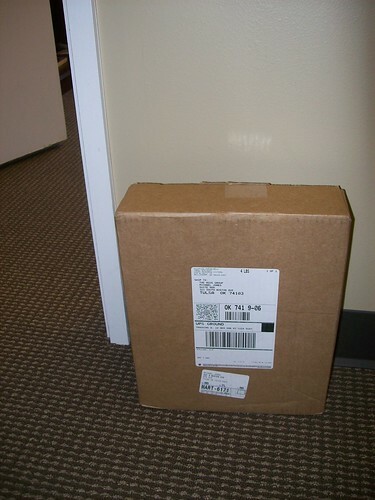 I had occasion to pick something up at the same office building where the publishing company had been housed. I'm pretty sure I haven't been there since the day I was laid off. The parking lot has been changed up a bit, and the lobby has been heavily remodeled (it looks fabulous). As I walked into the same set of doors that I had walked out of with my boxes of stuff, though, I felt a strong sense of sadness. I love the job I'm at now, but I loved that job too... so many friends and so many happy memories. I didn't and don't feel a sense of rejection about the whole thing... just a sense of loss. When we left our long-time church recently I was reflecting on how whenever God is telling me to make a change of some kind, basically the current situation just starts to become more and more uncomfortable until I do what needs to be done. Maybe that's part of why I had that "target-on-the-back" feeling, I don't know. Maybe I should have left voluntarily, and if I had I wouldn't have had quite the sense of having something taken away from me. But for whatever reason, yesterday as I entered the building I had once had an office in, even after the eight years in between I still felt the sting of loss. Thank God, He is good. Thank God He provided then and still provides now. Now our second child is roughly the age the first one was then. We still have the same mortgage. This is my third "permanent" job after the one I got laid off from. Even with all that, I guess there's still a little scar there. Maybe that hurt will never heal completely, I don't know. But I do know that I'm going to serve God no matter what, and one day it won't matter anymore anyway... I'll be with Jesus in Eternity, all hurts will be healed, and that day will be ancient, ancient history! I am moving the ScriptureMenu.com Web site to a new Web host. My other site, GuideToPetra.com, will be along for the ride as well. The hosting service where the site has always lived has some difficulties tech support-wise, and for the second time this month the site was taken down without warning because of what they cryptically call "resource abuse". I'm excited about the new host, APlus.net; after some pretty extensive research a few years ago I very nearly moved the sites over to APlus, but had a few difficulties that made it so much trouble to switch that I gave up trying. This time my old host has backed me into a corner; I've got to either move or resolve myself to them taking my sites down periodically without warning, so I have chosen to move. A move of this kind is tricky because the two sites are heavily database-integrated, so it's not just a matter of moving a bunch of Web pages... it means getting all of the database stuff set up properly as well. It is likely to take a few days to complete the work, so please be very patient with me as I get things squared away. I've got all of the information; it's just getting all the dots connected so it all works. Imagine that I have an engine block, a gas tank, a carburetor, and an alternator, all sitting in my garage next to my car. I've got everything I need; I've just got to hook it all together. I have a few design changes in mind as well; probably I'll get the sites working as they are first and then make the changes later, but don't be surprised if you see something new coming up soon! Update: ScriptureMenu.com is back up! You'll have to really search hard to find the few things that aren't working again now. GuideToPetra.com is still not fit for human consumption yet, but I expect to have it back up within a day or two. 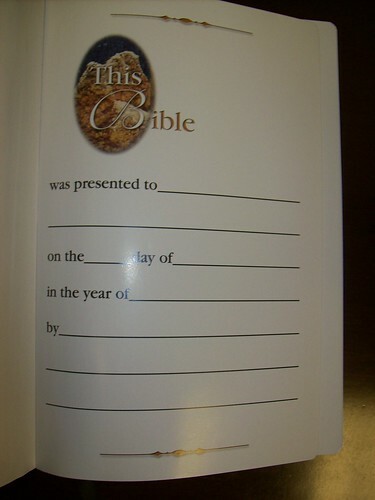 A few days ago, I got an email from ChristianBook.com about Bible software. I usually don't pay very close attention to that email, because although I've used QuickVerse and Logos both fairly extensively at various times, and sampled other Bible software packages, I've found the free e-Sword to have everything from the commercial packages that I've ever needed. 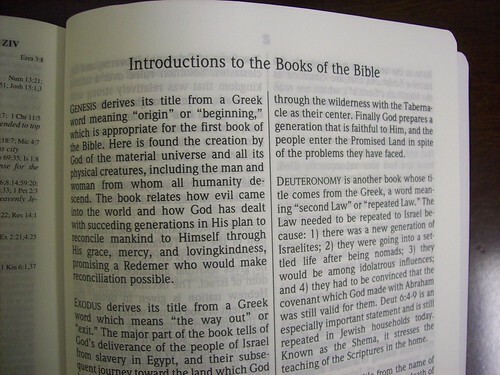 Generally, what I want is to be able to compare a fairly large number of English translations of the Bible easily. That means finding them quickly and then having the other translations at your fingertips. I like to have some commentaries available to me, too, as long as they cost me little or nothing. 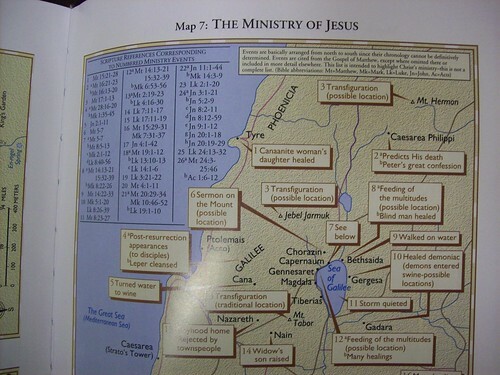 Photos of the Holy Land, videos, that sort of thing... even maps... generally have left me cold when they come from Bible software. But in that email, the simple, distinctive packaging of one of the boxes caught my eye enough to get me interested in taking a look. The package that caught my eye was the new Glo Bible software, which comes out today. And the more I saw, the more interested I got! Now, I haven't held a copy of this software in my hands. I haven't used it. I haven't even seen it in action in person, only on the demo videos. It looks to be fairly resource-intensive, so it might even not work very well on the aging computers I have at home. But boy, if you can get it to do what it's doing in the videos... WOW! I was totally WOWED after watching those demos! To my way of thinking, this is the first time since searchability (which I saw happening way back in the late 1980s) that Bible software has been created that can actually do something you can't do just as easily with a paper Bible. Because the features are based on "tags" placed on the Scripture verses by humans and not straight text searchability, the relationships between the verses feel a lot more organic. However... this may be a shortcoming of the software as well. If the people who tagged the text have a different theological perspective than you do, you may not agree with the way they've arranged things. Are you pre-Trib, mid-Trib, post-Trib? Depending on which is your theory of choice, the books of Revelation, Daniel, and even Isaiah and other prophetic books may not show up the way you'd like to see them in the Timeline lens. What about that passage from Isaiah about the king of Babylon... is that about a man, or about Satan? Your answer may effect whether you agree with the Timeline view on the placement of the passage. I also immediately noticed something in the demo of using multiple lenses together to narrow down your search. 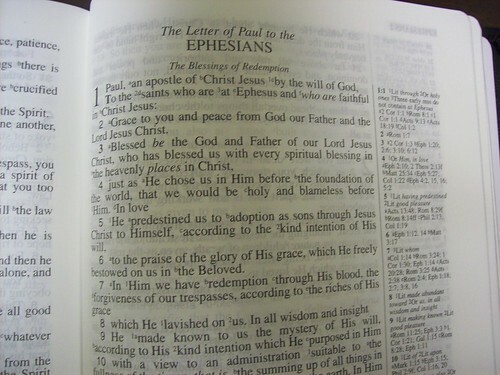 About five minutes into the "part 2" video above, there is a screen showing the location of all of the words of Jesus in the New Testament. There are passages in each of the Gospels, Acts, and Revelation... but what about this passage in 1 Corinthians? Looks like an unintentional omission to me. And the Topical view has potential to show Theological bias even more, especially in hot-button topics like abortion or eternal security. Don't get me wrong; every single study Bible and commentary has a bias, so this couldn't be an exception. But I don't see different editions of Glo based on your eschatology or whether you sprinkle or dip. I don't see a Catholic version and a Protestant version. Whatever is there, is there. That may change, though. Based on information you can find at BibleGlo.com, a lot of new stuff is coming down the pike... a full-length audio version, for example, and Web accessible and mobile phone versions, not to mention social networking features. It sounds like some of these new features will basically be downloadable. I can't see why there couldn't be separate flavors, using the same Bible text and multimedia materials, but simply tagging the Scritpure verses slightly differently... and then Glo owners could sort of "subscribe" to the "channel" that they fall in line with, and their own copies of Glo could change to reflect their own biases toward the text. 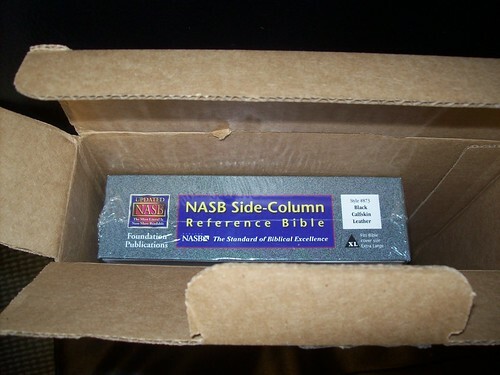 It appears that Glo will ship with the KJV and the NIV (it's a Zondervan product, and they own the NIV text) but there are negotiations taking place to add other versions... I probably wouldn't plunk down the money for myself until my ESV was represented. The very limited number of translations available at present is, to me, another very puzzling omission. Oddly, I don't actually see in the demos a way to do a straight word search. Can you find all of the places that the word "soul" appears in the text? Maybe so, but I don't see it... you might have to visit BibleGateway.com for that one. What about links to original-language materials? Where are the Strong's definitions and other similar material? I guess you'd better not delete your link to Blue Letter Bible quite yet. Now, I should be totally fair... those capabilities may be present in the software but not in the demos. Or maybe they have been intentionally left out in favor of cool stuff like 360-degree walk-throughs of historical locations and other stuff that would interest a more casual reader in the Bible text. 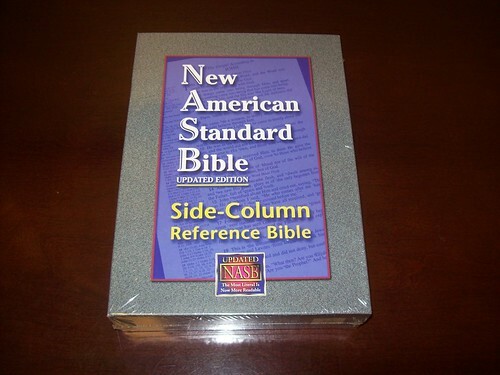 Obviously, this software is not targeted at your basic seminary professor or knowledgeable pastor... this is layman's software for people who want to know what God says about something but don't know how to find out. But I do hope there is a doorway there that people can walk through and get into more depth with the Scriptures. And that is my biggest concern with this awesome piece of software. Let's say you buy Glo, install it on your laptop, and then spend the next three weeks figuring out how everything works. You become a Glo expert, and you can find out which Scripture verses refer to insects with six legs, or which verses are about women whose names start with the letter "A", or whatever other crazy lookups you can think of. You continue to use the software every day, and you continue to find nuggets in the Word, but you never actually read all the way through any book of the Bible. In fact, you rarely read three verses in a row all at once. You use the lenses to severely limit which verses you read, based on what you tell it you want to know about. In that scenario, not only have you given yourself a bad case of Scriptural tunnel vision and destined yourself to begin to share the bias of whoever tagged the verses, but you are robbing yourself of the insight you can gain from context. You've turned yourself into someone who gets his Theology from the "promise box" on the kitchen table, or the snatches of Scripture that you hear in songs on Christian radio. I think the danger is that we can turn ourselves into fans of the Bible instead of students of the Bible. The Word is not a Whitman's Sampler where you can eat the ones with the caramel in them but leave the ones filled with pink stuff for your Aunt Gertie. The Bible is an all-or-nothing proposition. In an age where it is easy to zero in on specific verses, and where many preachers skip from one verse to another in the course of a message with no reference to context, we're not used to just plain old reading the Bible like the book it is. Now, Glo has a Bible reading plan built in (and it sounds like the plan is to have the mobile version and even the audio version sync up so that if you read a chapter at home and then listen to the next chapter in the car, eventually all of that information winds up back in Glo!) and there is absolutely nothing to stop you from reading it straight through (the Bible lens would actually be pretty great for that), so the "danger" isn't really a danger, but a caution to not let the very cool features of the software package deceive you into thinking you know all about what the Bible says just because you clicked into the Topical lens. To truly know the Word takes effort. Hard work. A great shovel is only the first step in digging up the riches present in the Bible. Software that can bring some of them a little closer to the surface for you is a great start, but it's not the whole journey. Even the coolest, shiniest, round-buttoniest software won't turn you into something you're not. If you're not a student of the Word, this software (or any software) will not change that, although given the right circumstances, a snazzy interface may get you to engage the text in a way you wouldn't have been otherwise. When it all comes down to it, either you're hungry for the Word, or you're not. This software probably won't make you hungry. But if you are hungry, this software could be like an express train from your house directly to Olive Garden. It'll get you to places you never thought to go, faster and easier than ever before, and in ways you never dreamed of (or maybe you did dream of but never thought it could actually happen). I hope I actually get a chance to play with this sometime. Besides being an awesome tool, it just looks incredibly fun! I doubt it'll have me giving up my ESV Study Bible (my favorite Bible study resource of all time), but it could add a dynamism to my study times that wouldn't be there otherwise. I'll be watching Glo to see where it goes next. Glad to be here at lift-off! Everything is different, but the same. Things are more moderner than before, bigger... and yet smaller! It's computers! ...SAN DIMAS HIGH SCHOOL FOOTBALL RULES! This morning I was walking through my neighborhood in the rain. Sort of. When you ride the bus to work, you have three options when it comes to weather: (1) Stay home when the weather is unpleasant (not a viable option); (2) wimp out and drive that day; or (3) learn to enjoy the weather, or at least put up with it. I had decided to rise to the challenge and not let a few drizzle drops force me to have to negotiate traffic for myself. That's what umbrellas are for, right? Anyway, when I actually got out into the neighborhood, I realized that the only place it was still raining was under the trees. The rain had stopped, but there was water on leaves and when the wind blew, the water would come on down and seem just like rain. I was either going to have to open my umbrella, or get out from under those trees. I opted for the second option... umbrellas can be a real pain in the neck in Oklahoma wind. The only way to get out from under the trees was to walk out in the street, so that's what I did. As I walked, I thought about all of the times I've walked that particular route. I've been riding the bus for several years now, and some times of year it's hot and I seek out the shade of the same trees I was trying to avoid. I've walked in pretty heavy downpours, too, where it really didn't matter much whether I was under trees or not... I was going to get soaked. I've also walked through the neighborhood at other times when everything was frozen and there were no leaves at all on the trees. Then something came to me. A few weeks ago here, it was pretty hot out. Then, I had sought the shade of the same trees I was avoiding. The neighborhood was largely the same, but my experience of it was different. Why? Two reasons: the weather, and my response to the weather. I could have walked exactly the same footsteps I had walked on a hot day, and my experience would still have been a little different... but instead I was altering my route a bit, and my experience of the neighborhood was quite a bit different. And I thought about God. Several years ago I blogged about how God remains the same, even though our experience of Him changes at different times. But it seems to me that my walk through the neighborhood sheds a slightly different light on things. The neighborhood is the same; my experience of it changes based on (1) the season, and (2) my reaction to the circumstances. What if the way we experience God changes for the same reasons? What if we experience Him differently in different seasons, and even within that context, in different ways based on our response to those different circumstances?